Crash Course DVD Video Downloads Coming Soon! 1. Project turn around time will be 4-6 weeks faster. 2. Customers will be able to get their training lessons immediately. 3. It allows for easy updates and corrections, such as the Photoshop Crash Course. 4. It will eliminate shipping costs, which in most cases reflects about 25% of the overall fee. 5. 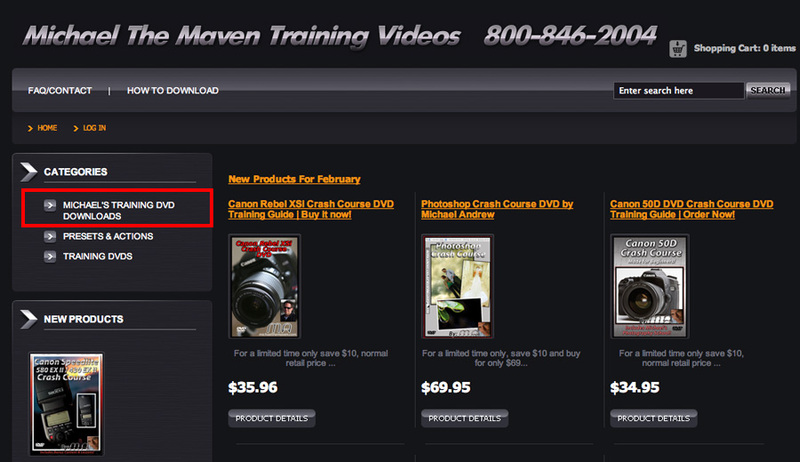 Allows me to offer discontinued DVD products indefinitely (such as the Canon 40D DVD) without having to re-print disks. With Netflix, iTunes and many other companies offering downloads, the DVD really can be on it's way out. The original store will still be live, but the new store, under the new website name should go live in the next few days. Nearly all DVDs will be available for download, with the exception of the Business Crash Course DVD, which will remain available on disk. I feel that for the most part, my customers are good, honest people who support what I am doing and will continue to buy my products as downloads if they choose. The DVDs will still be available from 2 different sites for now. We are just testing the download features over the next few days and it should be good to go shortly.